THE KINGS LYNN MART NORFOLK. Mart Fair. Kings Lynn, Norfolk 1974. 14 February, the Mayor Mr Edgar E.G. 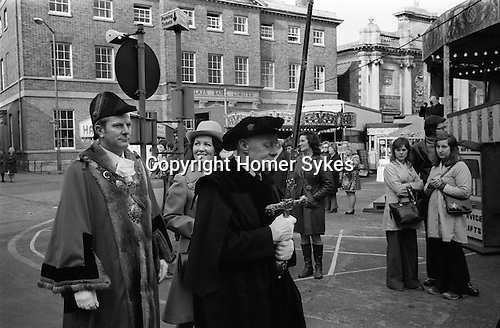 Edgley and Lady Mayoress process to the opening of the Charter Fair granted by Henry VIII in 1537, and as such is considered one of the oldest Mart fairs in the world. The first recorded Charter granted to the town was in 1204. However the Charter marking the Valentine's Day fair was granted by Henry VIII in 1537. The first recorded Charter granted to the town was in 1204 during the reign of King John. A Charter marking the Valentine's Day fair was granted by Henry VIII in 1537, and as such is considered one of the oldest Mart fairs in the world. The fair takes place in the Tuesday Market Place with the Mayor and Chairman of the Markets Committee accompanied by local dignitaries and officials of the Showmen's Guild performing an opening ceremony by a blessing on the fair and the show people who attend it. This Valentine’s Day fair is traditionally the first showman's fair of the year. During the later half of the nineteenth century the Mart was a spectacular event in which Frederick Savage of King's Lynn displayed his latest roundabouts and fairground attractions to the showmen. This display of new machines and amusements continues with the showmen vying to display the latest amusements. In 1897 Randall Williams became the first showman to display moving pictures at the fair. By the following year four cinematograph booths were on display. After the opening ceremony it is now traditional for local dignitaries to take rides on various fair ground attractions.